A deliciously unique birthday gift! 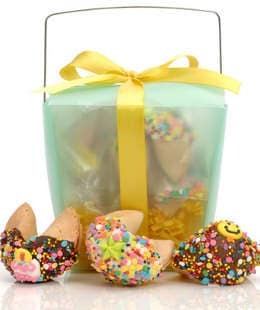 Twelve of our fresh-baked fortune cookies, dipped in chocolate, rolled in sprinkles and packaged in a clear take out pail. 5-6 weeks when unopened and stored properly. 2 Days (plus transit time). Rush Service Available. One of our most unique birthday gifts, they'll remember getting these custom fortune cookies with a smile! These fortune cookies are handmade and fresh-baked from high quality ingredients, with just the right crunch and vanilla flavor. We often hear - "These don't taste like fortune cookies!" That's right - these are not at all what you get with Chinese takeout. Our custom fortune cookie recipe delivers absolutely delicious cookies every time, with a gourmet chocolate dip on the outside to hold festive sprinkles. You can choose up to two sprinkle colors for your birthday fortune cookies. Inside, your message can be from our generic message sets or you can custom design your own cookies with personalized text. We're happy to accommodate requests big and small - just fill out the Request Estimate form above and one of our Gift Experts will get right back to you.